Amazon.com today announced that it is to start selling DRM-free tracks from the EMI back catalogue through its online music store. The tracks will be available from a new music download service which is expected to launch in the USA later this year. Just like Apple's iTunes Store , Amazon will offer EMI Music's entire digital catalogue as unrestricted MP3s. Amazon's copy protection-free MP3s will allow you to play their music on virtually any personal music device, including PCs and Macs, Apple iPods, Microsoft's Zune music player. You'll also be able to burn Amazon's songs to CDs for personal use. The Amazon.com online music store will offer tracks and entire albums as MP3 files free of DRM restrictions. EMI is the first major record label to offers its entire digital back catalogue for sale. Its artists include Pink Floyd, Coldplay, Lily Allen, and Joss Stone, among others. Last month, EMI launched its premium download service . This lets retailers such as the iTunes Store sell DRM-free music in the audio format of their choice, with bit rates going up to CD quality. "Amazon.com is synonymous with a great consumer experience, and they have become an important retail partner of ours," said Eric Nicoli, CEO of EMI Group. 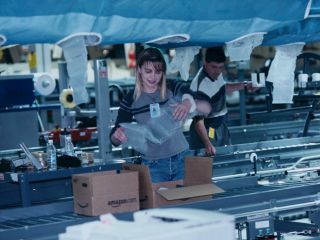 "Amazon.com's deep understanding of consumers and vast knowledge of music paves the way for a smooth entry into the digital arena. Their arrival in the digital music market will offer even more consumer choice and will be a big advance in addressing the lack of interoperability which has frustrated many music fans," Nicoli added. Jeff Bezos, CEO of Amazon.com, said: "Our MP3-only strategy means all the music that customers buy on Amazon is always DRM-free and plays on any device." DRM, or digital rights management, has been backed by the music industry. It is intended to reduce piracy by preventing users from making multiple copies of tracks and albums. Critics say it restricts consumers, hindering the growth of legal music uses.